Cadmus | Learn about Greek Mythology,Greek gods,Greek mythology stories! In Greek mythology, Cadmus is the son of Agenor and Telephassa, brother of Finika,of Cilica and Europe. When Zeus abducted Europe,Cadmus started searching for his sister, but the Oracle of Delphi gave him an order to stop the search and follow a cow and where the cow stopped, he should build a new city. Thus founded by Cadmus the city of Thebes. 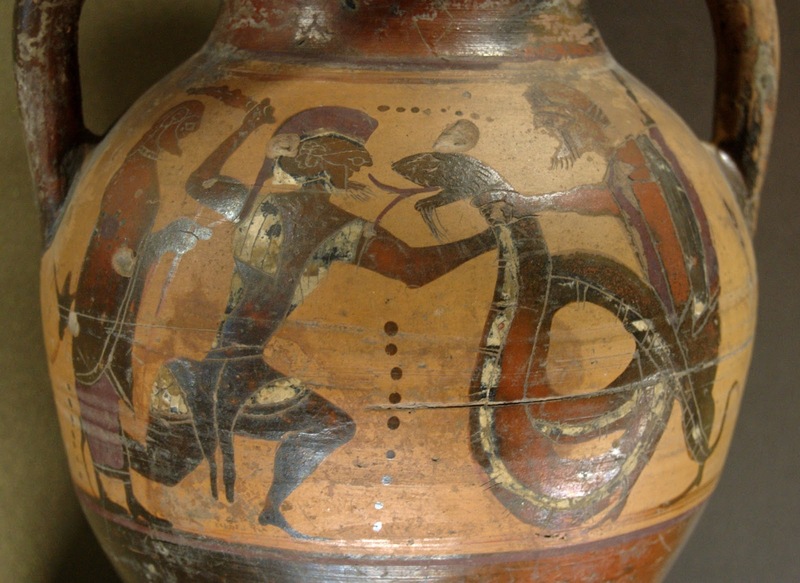 Cadmus killed a dragon that guarded a nearby source of Thebes. The dragon, however, was the son of Ares and the nymph Telphousa so Cadmus was forced to serve as slave Ares for one year. By order of Ares or with the advice of Athena, according to other legends, Cadmus sowed half the dragon's teeth in a plowed field and from the earth grew fierce warriors named Sparta. With a clever plan of Cadmus they killed each other and only five survived, and they were the first citizens of Thebes. As a reward the god if war gave him as wife his daughter, Harmony. Cadmus donated his wife a veil made ​​of Athena and a famous necklace, known as the necklace of Harmony,created by Hephaestus.